On the surface, Brainstorm may not fit the traditional mold of a feature in the Flora Issue. They aren’t floral designers or flower farmers. They don’t own a nursery or garden center either. Despite this issue being all about the native flora of New England, we truthfully did not want to overload these pages with the expected. Like many makers and entrepreneurs we’ve highlighted in the past, we set out again to tell a unique story by scratching the surface a bit deeper. Briana and Jason started Brainstorm over 10 years ago when they met in college. The pair were students within the art program at Rowan University, a liberal arts college in New Jersey. They happened to meet one day in the print room and bonded over a shared passion for printmaking and design. Not long after, the duo began collaborating on projects together, effectively merging their two art studies (Graphic Design for Briana and Art Education for Jason) for a greater good. Thus, ‘Brainstorm’ was born. Post-college, the pair moved to Philadelphia where they operated out of a live-work space for a couple of years. Briana freelanced on a multitude of projects while Jason worked back at Rowan University. They continued to grow Brainstorm on the side, dedicating nights, weekends and whatever time they could to foster growth of their business. In 2011, unbeknownst to them, a buyer from Urban Outfitters stopped by their booth during an art show in Philly. A month later, the company reached out expressing interest in some of their prints for their home-décor line. The wholesale purchase gave them the moral boost and confidence they needed that Brainstorm could be a successful business. Realizing that running a print business would require more space than their loft, they set out to find a home base and proper studio for Brainstorm. It was no easy task. With no strong ties to Philadelphia, they realized that the U.S. was essentially up for the taking. After much deliberation, they found themselves consistently drawn to the north – specifically New England. So with that, they embarked on a road trip (during Hurricane Irene to boot) through New England in search of the perfect studio space. Drawn to the open floor plans and easy to maneuver spaces of the historic mills of Portsmouth and Dover, they landed at the Washington Street Mill situated along the Cocheco River in Dover, New Hampshire. Six years later, the duo is still there and business is booming. Largely, their creative process is a collaboration from start to finish. Jason illustrates all of the small pieces often seen in each poster by hand. Once his process is finished, Briana takes the illustrations and designs and lays out each poster. Together they work to tweak color, placement and the like – essentially passing the poster back and forth until both feel satisfied with the creation. From there, they will print the posters. 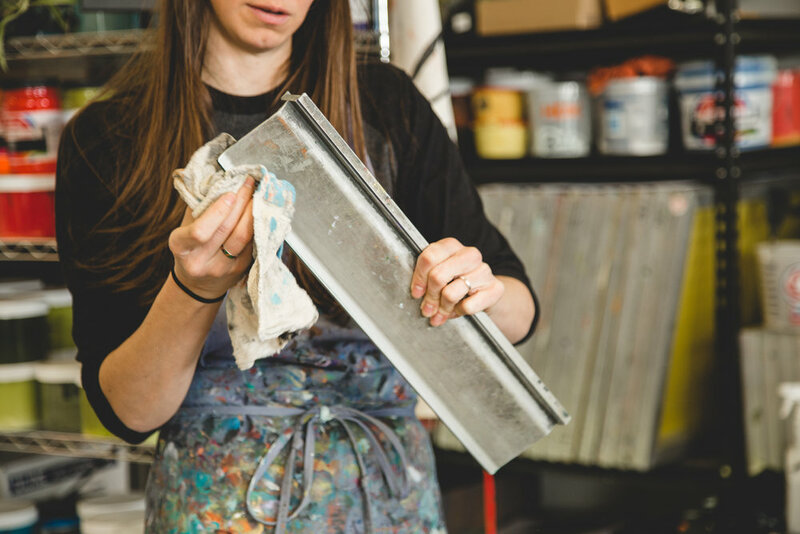 Jason – the head screen printer within the studio, is tasked with this part of the process. 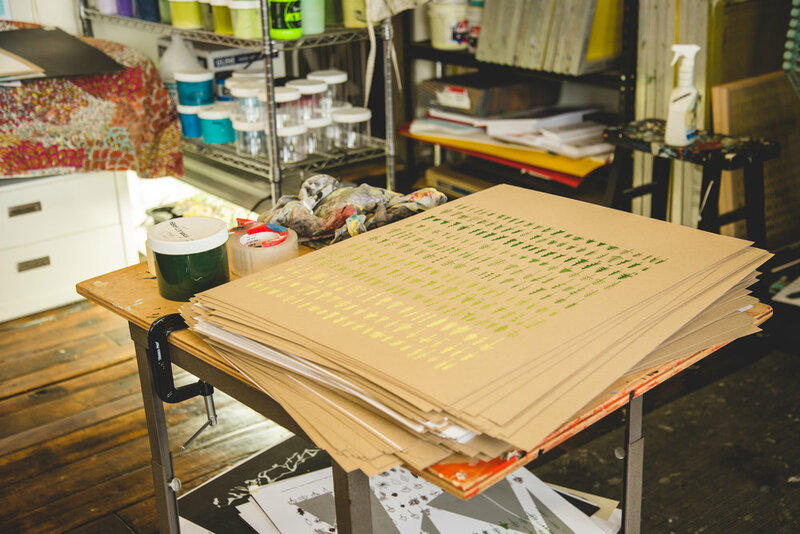 The process of screen printing is no simple task. It is an art form in and of itself – and one that takes time, but a crucial aspect of each of Brainstorm’s creations. Screen printing, or also known as silk screening, is one of the oldest forms of print making. The process essentially involves creating a stencil of an image on a porous, mesh screen (traditionally made of silk). A squeegee is then used to pull ink over the stenciled image, forcing it through the mesh and onto the paper below – thus creating a printed image. Before the duo gets printing, they need to create and prepare the screens (or stencils if you will). Here’s essentially how the process works; begin by taking your desired printed image and make it a totally black negative. You then shoot it with UV light onto a screen the same way you would using black and white film in a camera. In a dark room, you will then coat screens and essentially turn them into giant rolls of film. Next, you will shoot the screen. Whatever is blocked by the light becomes your stencil. Outside of the studio, the pair spends as much time as possible exploring the region and immersing themselves in nature with their sidekick, and studio dog, Maple. Their love for the outdoors is evident in almost every poster they have created, from their Campfires print to their Pine & Beech Family prints to their newly released prints of Maine and Acadia National Park. Their Pine Family print, all made up of the lower classifications of the Pinacea family, include a colorful pattern of hand-illustrated and screen-printed versions of the native trees we see here in New England. The Beech Family print also highlights these native trees in the same bright and poppy way. And thus, our opportunity to feature them in the Flora Issue arrived. When asked what inspired them to make such uniquely specific posters, the answer seemed simple enough. It was ultimately hiking and being outdoors in New England, especially up in the White Mountains. The scenes that unfolded and the scents that surrounded were reason enough to put ink to paper. And that was reason enough for us, too. We always gravitate towards businesses who are deeply rooted in the region, and it’s evident that Brainstorm has found not only a perfect home in New England, but also an endless source of inspiration – from the rocky coastline of Maine to the mountains of New Hampshire to the rolling farmlands of Vermont.